Huesca vs Barcelona Live Streaming Online: How to Get Spanish La Liga 2018–19 Match Live Telecast on TV & Free Football Score Updates in Indian Time? 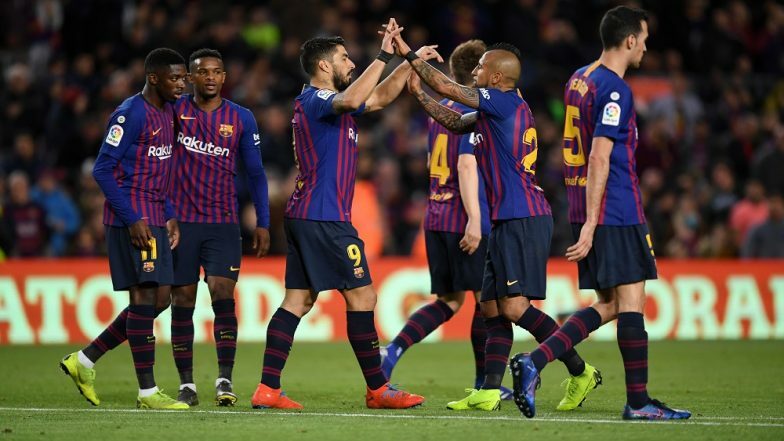 Barcelona are currently enjoying a 11 point lead in the Spanish La Liga and a win against Huesca at the Estadio El Alcoraz significantly boosts their chances of retaining the title. After an impressive win against Manchester United in an away tie, they will switch their focus on the league which is almost done and dusted. Any more Atletico Madrid slip-ups mean they have a strong chance of closing the title in about three weeks’ time. The last time they faced Huesca, the Catalonians ran out as 8-2 winners which is not good news for Huesca supporters. Huesca vs Barcelona Live Football Score. Central defender Xabier Etxeita missed the last game for Huesca due to suspension but should be back in the starting eleven against Barcelona. The player who is on loan from Atletico Bilbao is quite capable of stopping the Barcelona juggernaut provided he gets the support of his midfield. Ezequiel Avil is their leading goal scorer with 8 goals to his name and should start up top along with Enric Gallego. Gallego is in good form for Huesca having scored in his last two games and the 32-year-old still has the pace needed to excel in top-flight football. Gerard Pique and Luis Suarez are both suspended for Barcelona while Ivan Rakitic has been ruled out with fever. Lionel Messi who played the whole 90 minutes against the Red Devils despite a nose injury has been left out of the squad along with midfield maestro Sergio Busquets. The unavailability of key players presents fringe players like Malcolm and Kevin Prince Boateng opportunities to shine. Ousmane Dembele is fit again and will likely start in the left side of the Barcelona forward line. This is Barcelona’s first trip to Huesca in their history and the depth in the squad will get them over the finishing line despite not playing their preferred eleven. When is Huesca vs Barcelona, La Liga 2018-19 Football Match Schedule (Date, Time and Venue Details)? Huesca and Barcelona lock horns against each other in the La Liga match on April 13, 2019, Saturday. The bottom-placed team is hosting the top-ranked team in a match that will be held at the Estadio El Alcoraz. It will kick off at 7:45 PM IST. How to Watch Live Telecast of Huesca vs Barcelona, La Liga 2018-19 Football Match? Sony Pictures Networks holds the broadcast rights of La Liga in India. So, the Huesca vs Barcelona match will be live telecast on Sony Six and Sony Six HD channels. Where to Get Free Live Streaming Online of Huesca vs Barcelona, La Liga 2018-19 Football Match? If you are unable to watch the match live on their TV sets, you can catch Huesca vs Barcelona match online via live streaming on Sony Liv app as well as on La Liga's official Facebook page. You can also live football score updates on LatestLY here. Barcelona will extract revenge by thrashing Leganes at home, and it could very well turn out to be a high scoring game. Expect Lionel Messi to be on the scoresheet and also notch an assist.